Lake District Ospreys in Africa. Both our young Ospreys are now in Africa. Number 15 crossed the Alboran Sea (area east of Gibraltar) on Tuesday and roosted that night in Morocco. Number 14 has now crossed the Sahara Desert and has entered the Niger River system just north of Bamako – another Quiz answer? Bamako as everyone knows is the capital city of Mali with a population of 1.8 million. Fortunately our bird was last recorded as being thirty miles to the west but approximately six hundred miles due east from the Gambian coastline. If he continues flying south he could enter Liberia or Sierra Leone. 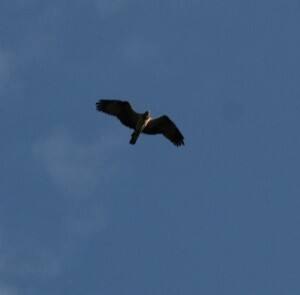 Lake District Osprey Over the Sahara. 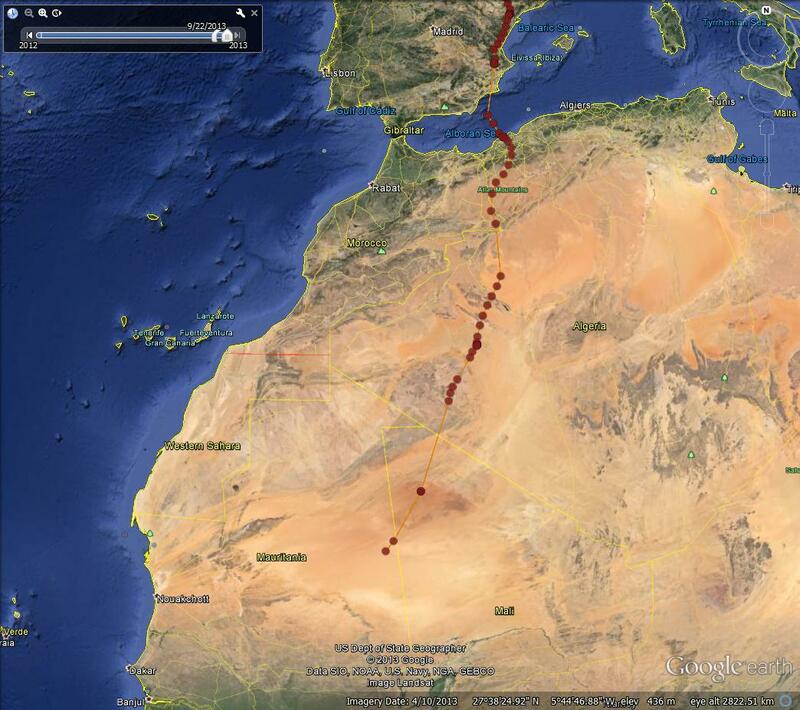 It is not every day that we can say that this afternoon at 3.00pm one of our Ospreys was flying over the Sahara Desert. We can today. Number 14 left the north coast of Africa at approximately 9.00 on the 18th, crossed the Atlas Mountains by 1600 on that day. 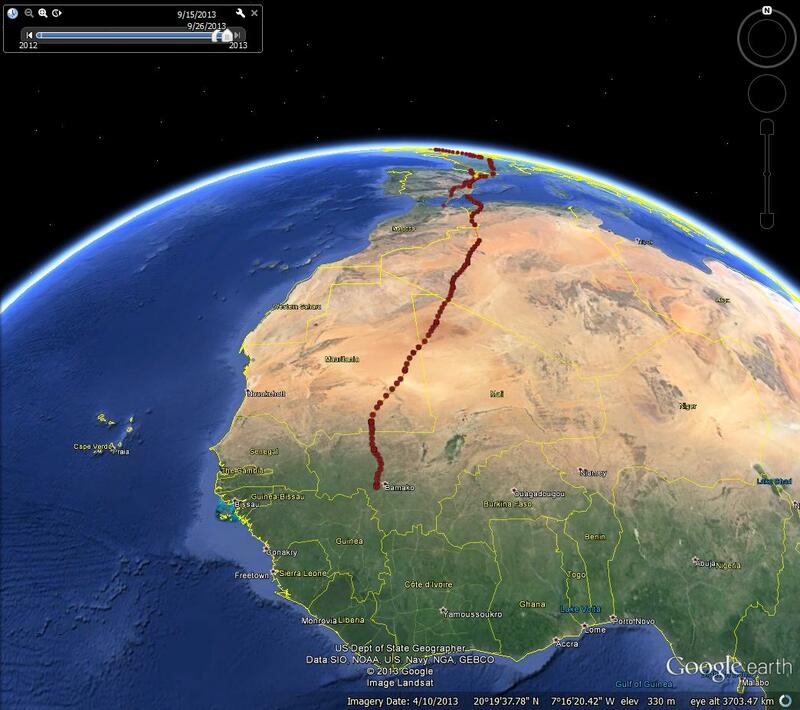 By 6.00 this morning was crossing the north west corner of Mali ‘Tombouctou’ and by 1500 this afternoon had reached the eastern side of Mauritania – get ‘Pointless zero points if you name the capital city (clue on map) – He was flying at 1596m at a speed of 57kph, having covered over a thousand miles since leaving the coast with eight hundred miles to go before the coast of Gambia will come into sight. 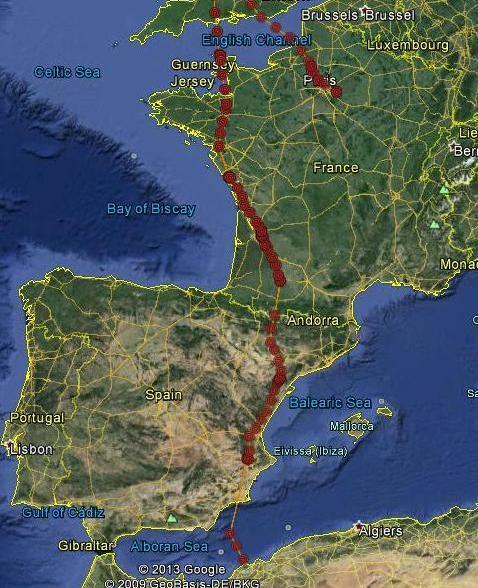 Number 15 has now left France and at lunchtime today was making her way down the east coast of Spain. It is difficult country ahead of both of them so keep all those fingers crossed. 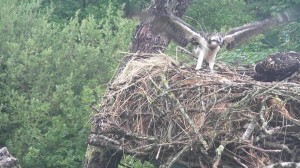 Our latest satellite download show that our young ospreys are making steady progress. Number 14 our young male has crossed the Pyrenees and entered Spain. He then followed the east coast south, almost crossing where we lost the signal for Number 13 last year and then crossing the Mediterranean east of Gibraltar to find an early roost on the North African shoreline west of Algiers. Meanwhile Number 15 has progressed from Preston, like her brother following the M6 and M5 south down to Worcester. Here she took a different course and by lunchtime of the 16th was over the sea south of Brighton. After a two hour crossing she met the French coast near Dieppe. By lunchtime on Tuesday 17th she was over central Paris, finally roosting just to the east. This takes both birds up to their roosting site yesterday evening – Tuesday 17th September. Lake District Ospreys on the move. Both our young ospreys are on migration. Number 14 left Bassenthwaite on the morning of Tuesday 10th September. Having whizzed through England with a strong tail wind behind him, his first roost was just north-west of Cherbourg on Tuesday night. 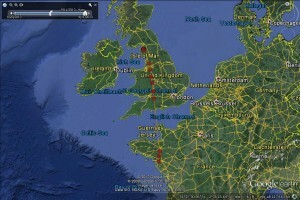 His most recent position on Saturday afternoon (1400) was south-east of Bordeaux, heading towards the Pyrenees. Meanwhile on Saturday, Number 15 left Bassenthwaite on a similar route to her brother but at a more leisurely speed. By 1100 she was over Coniston, by mid-day just north-west of Nether Kellet having a break. Our last position recorded so far was 1400 just south-west of Preston near the village of Brindle. Any Ospreys around Bassenthwaite now are either passing through or possibly our male. Number 14 is off ! He was over Derwentwater at 10am on Tuesday, and then continued South at a pace, and reached the Severn Valley by mid afternoon. He crossed the Channel at the Isle of Purbrek and probably roosted in Northern France that night. A truly epic initial journey for this young bird. Yesterday he was West of Nates in Brittany at 15.00, and his signal last sent a reading as he was heading for the Northern end of the Bay of Biscay. Sunday 01st September was the final day of the LDOPs 13th season, and did throw up some late season drama. We had three birds today, two chicks and the male, but they were joined briefly by a fourth….it was not KL, but was a bird with a blue ring on its Left leg, we think KT, or possibly KY. If anyone has any further information, please let us know. Suffice to say, it will sadly not allow us to run the project any longer, but please remember, you are still more than welcome to visit the viewpoints at Dodd Wood, which remain open all year, but please be aware that they will no longer be staffed and optics will not be available, so please bring your own. Many thanks for your support, on behalf of all of the staff and volunteers, and hopefully you will enjoy our chicks miraculous journeys to Africa.